Here’s why I left it out: Unlike the trumpet lick, the opening of the Simpsons theme was definitely not inspired by “Maria.” Elfman was paying tribute to something, but it wasn’t West Side Story. It was The Jetsons. Back in the 1990s, if a producer really really liked a composer, he would give him a mix tape. As The Simpsons was in development, Matt Groening gave Danny Elfman a tape with all of his favorite cartoon music. He loved the music for Warner Bros. cartoons and Tom & Jerry, but he didn’t want to use that technique known as “mickeymousing” in which the music closely parrots the action on screen. That left Hanna Barbera, including Groening’s favorite cartoon theme of all: “I loved The Jetsons theme the best,” he said. Also not a coincidence: both are in that unusual Lydian dominant mode I banged on about last time — 4 up and 7 down. Oh but that’s not all. 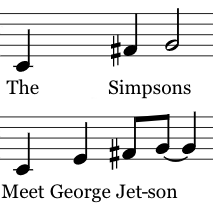 The whole Simpsons opening sequence is an inside-out parody of The Jetsons opening sequence. In The Jetsons, you start with blue sky and Dad driving away from home. Two kids go to school, then Mom goes shopping, then Dad arrives at work. In The Simpsons, you start with blue sky and Dad driving FROM work, Mom leaves the store, the kids leave school, and they all converge at home. Both openings are below. For maximum fun, play them at the same time. For more convincing, listen to the short Groening interview below.